View of Rangoli art on display at the 2015 Diwali Festival celebrations, held in Aotea Square, Auckland Central. Diwali is also known as Deepavali, Dipavali, Dewali, Deepawali, or the Festival of Lights. It is celebrated in October or November each year. Diwali celebrations can last for about five days. View of traditional Indian crafts, showing rangoli patterned decorations, on display at the 2015 Diwali Festival celebrations. View of traditional Indian crafts, on display at the 2015 Diwali Festival celebrations. The story of Diwali being performed as a colourful, English scripted drama by members of the Hare Krishna Group at the Waitakere Indian Association Diwali 2014 celebrations. Prayers and an offering ritual at a 2012 Diwali celebration. View of traditional Indian jewelry, on display at the 2015 Diwali Festival celebrations. Jason Moon covers a weekend of Diwali celebrations. Article about the annual Diwali celebrations in Hamilton. 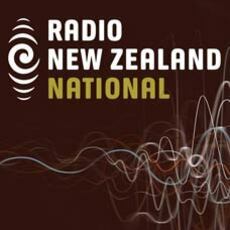 The growth of Indian religions and celebrations in New Zealand. Factors that have transformed Diwali including support by Auckland council. View of performers backstage at the 2013 Waitakere Indian Association Diwali celebrations. View of traditional Indian merchandise on display at 2014 Diwali celebrations. Students performing traditional Hindu prayers and Diwali songs at Diwali 2012 celebration. View of traditional Indian decorations on display at the 2015 Diwali Festival celebrations. View of traditional Indian shoes (mojaris), on display at the 2015 Diwali festival celebrations. In this filmed interview, Iyer, an Indian woman living in New Plymouth, talks of the need to explain some Indian cultural practices to other New Zealanders, particularly children. 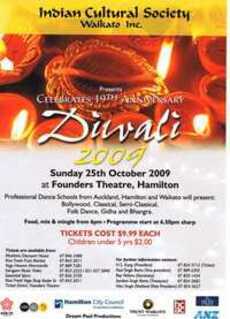 The origins of Diwali celebrations in the Waikato. Photos of Pongal and Diwali taken by the President of the Tamil Society of Waikato. View of performers at Auckland Diwali Festival 2015 celebrations held in Aotea Square, Auckland Central. Women are wearing traditional Indian saris and jewelry. Diwali quotes in English and Hindi to express wishes to friends and family. Diwali is an ancient Hindu festival that marks the beginning of the new year. Lantern use to celebrate Diwali. This video explains what Diwali means for different groups of people in India. Diwali meaning, festivities and traditions. Celebration of Diwali that includes good food, fireworks, coloured sand, and lamps. Henna being applied to a hand during Diwali. Noise and air pollution at Diwali. Lesson plan to help comprehension and celebration of Diwali. What clothes are worn for Diwali? Special clothing is traditionally worn for the Hindu festival of lights called Diwali. 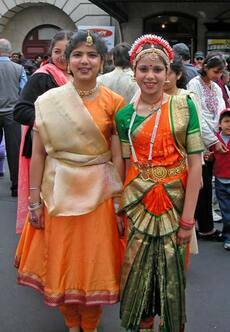 Thousands of people gathered in central Auckland today to celebrate the Diwali festival. Tips and advice on how to clean and prepare your house for Diwali. Lakshmi puja or the worship of the goddess of wealth and its significance. Lamps lit for the Diwali festival. A gallery of items related to craft ideas for Diwali. Sweets, snacks and main course recipes for Diwali. A gallery of items on Rangoli (colourful traditional art) for Diwali. Precautions for children and adults when lighting of fireworks during Diwali. The meaning of Hinduism, the history, and its festivals. The significance and place of diyas (lamps) in the celebration of Diwali. Lesson plan covering social science, maths, art and literacy. Article about the biggest Diwali celebration outside India. During Diwali Indian women and, girls wear Mehndi/henna on their palms, shoulders, full hands and legs. An understanding of the spiritual preparation of oneself for Diwali. Asia New Zealand Foundation celebrates Diwali in New Zealand. Fireworks have become an important part of Diwali celebrations. Facts in brief about Diwali and celebration around the world. Slideshow of images of people enjoying Diwali. This guide deals with all aspects of Diwali and a chance to enjoy the festival with a family. Five days of Diwali, their significance and links to legends and traditions. Cartoon animation of the story of Diwali. A photograph of a hand with a henna decoration. Most cultures in the world have their own form of dance, performed with traditional music and costumes. Looks at the transformation of Diwali by various organisations as an expression of self-identity. This 1919 article mentions Hogmanay and Diwali, two cultural festivals that celebrate New Year. EPIC contains a number of databases with useful information related to New Zealand history and first contact between Polynesian, Māori and Pakeha including the Bridget Williams Books collections. Book extract that mentions the Diwali festival. Diwali also known as Deepavali and the festival of lights is an ancient Hindu festival. A number of flamboyant Hindu festivals are organized by Fijian-Indian community throughout the year. A list of the major Hindu festivals including Diwali. Diwali, the festival of lights is celebrated by Hindus, Jains and Sikhs. Poems, an animated multilingual rhyme and an essay for an eco-friendly Diwali. Discover the fascinating festival of lights.